Erm, oh, hi there! I could have sworn I was better about updating than this. I can’t believe you’re still around, reading this at all! (And believe me, I am truly grateful that you are!) I could make a bizillion million excuses for why I haven’t been around. But the truth is, things have been busy, in a good way. My previous post on here marks the start of my new wonderful job. And since then, money problems have just not been on the forefront of my mind. Sure, I’m not making the big bucks (by any standard), but… well, let’s get to the numbers first, then we’ll talk details. Up, down, up! 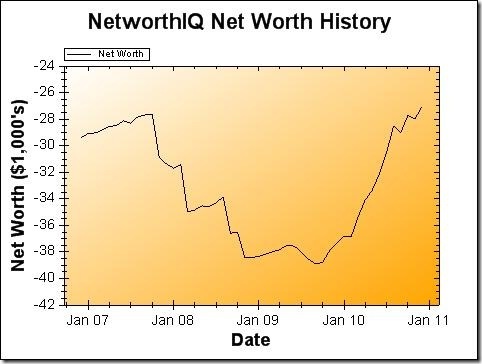 And all three months, higher than any net worth posted on this blog before that. Slowly, I work my way up from the deep valley of student loan debt – constantly reminded that my highest net worth was at age 17, when I hadn’t taken on any loans at all yet! And I also need to bear in mind that my tax bill this year will drop my net worth down to a more realistic level. But my savings are growing, slowly yet steadily. I haven’t been able to contribute any more to a retirement fund yet, since my job situation was so shaky for part of the year, I have been much more focused on more liquid savings (like my emergency fund). I hope I can scrape up some money to throw into my Roth IRA before the April deadline, but I won’t cry a river if I can’t. This entry marks 4 solid years of updating this graph monthly. (Even if I haven’t managed to do so well at blogging about it during the last six months, I have updated the graph consistently!) The overall picture (something like a jack-o-lantern grin) is starting to become clear. I’m excited to see where it will go from here. And I hope, since you’ve come this far with me, you’ll stick around to see where it goes, too. 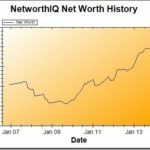 If you have any questions about my net worth or how it is calculated, feel free to ask them in the comments. 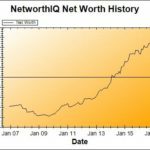 My highest net worth was at 17 too! Sigh. It’s nice to see it going up. Keep up the good work! I love your realism — with your highest net worth at age 17. At least you grasp that concept, though. I know a lot of people who think they’re doing so well because they’re employed and bring in a paycheck … but in reality, they have so much debt. They were better off financially as teens. You’ll get those loans paid off! At least your debt is from education, not material things. I do have questions! Your blog has been so inspiring to me, a college student just beginning to see the end and the debts waiting to be paid off. Is there a good intro post about your net worth charts? I would like to begin making my own but I don’t want you to have to repeat everything. Could you direct me to some sort of a starting place? Yes, getting older isn’t financially fun. As a teen you really don’t have any financial debts. In your 20’s you have rent and car payments. In your 30’s mortgage and children. From then on children are still helping on your financial debt. Cheers! 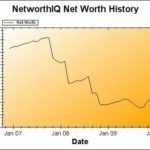 You net worth is much better than lots of us! Once you have a stable job, continue to live like a college student and pay off your debts as early as you can. Considering were in a recesion your doing very well. centainly better than me at the moment. Hi Stepahine! This is my second time to visit your blog and my first time to comment. I love how you document your finances. Like Heidi, I would also like to start documenting my net worth. Stephanie, I appreciate your level of openness about a subject that a story that is common to many. Keep at it. It really is a grind, but don’t think of “grind” as a bad word. It simply means steady progress forward. Good for you and congratulations. Great post! I will be back! You don’t have a care (or debt) in the world at 17, good old days hey!! Looks like things are going well for you so keep it up!! Not so well here although I am going to get on it and get out of then 15k debt asap. Will be monitoring your progress too, maybe a race to 0!! Your site have cracked! Check up through search Google, your site refers to viagra. 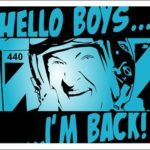 @Anonymous: Thanks for the heads up, but that has already been patched – Google has just not re-crawled my site to see the fix. Thanks anyway, though! You haven’t corrected a problem! Come under the reference http://www.google.com/search?q=best+price+cialis&hl=en&gl=US&gs_rfai=&aq=f&aqi=g2g-v8&aql=&oq= and will see the site in first ten. Press the site and you will throw on a drugstore. The hacker code is built in your site. Check up once again! I appreciate the concern, but we do have the problem under control. A permanent fix is in the works. Thanks for keeping this information updated. 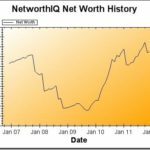 It helps to know how to get great net worth when you reach age 35. I have a few years to go yet. Keep up with your plan, over the longer term you will see your asset base grow. The real trick is to spend less than you earn. I am glad that you were able to achieve financial stability. I do believe that holding on to every penny would still count despite your higher net worth. You’ll never know when a crisis would hit you!